CHIMINEA, FIRE PITS AND ACCESSORIES > Fire Pit Safety Screens > Custom Made Fire Pit Screens! Custom Made Fire Pit Screens! If your screen size is larger then 48"
Would you like a can of 1400 degree high heat paint? Shipping on all Screens 48" or smaller Flat Fee $50! For more Detailed Information and Pictures click here. We custom manufacture Fire Pit Spark / Ember safety screens for out door fire pits. Our screens are crafted in Fort Worth Texas. My name is Jim Jarvis and I own Dancing Fire Inc. If you have any questions my cell number is 817.946.6463. Call anytime with any questions. 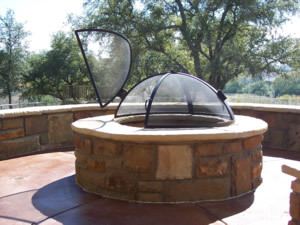 We only offer two types of Fire Pit Screens and we have options with both. WE DO NOT MAKE OR HAVE ANYTHING TO DO WITH THE PIVOTING TYPE SCREENS. To dangerous, to expensive to ship and not very attractive on your beautiful fire pit. By the time you pay shipping on the pivoting screens you'd get a much better product, cheaper by going with our deluxe four door screen. This pivoting style started out as a Chinese Imported design and served it's purpose and some competitors thought it was cool to knock off. I made one and I used it and then I tried shipping it. Drop that 25 pound HOT door when you closing it and you will see what I'm talking about and then your opening the door up into the fire vs. out and away from the fire and heat like our four piece screens. The Chinese units come in pieces that you assembled making them cheap to ship. You can't do that with the heavy duty types. They all ship on a pallet via a freight company. We manufucture what I call a Chinese buster. Let's face it imports are cheaper most of the time. I've designed this screen to beat the imports with just as good pricing but better product. We make a one piece screen that you slide out of they way or lift off to add wood. This screen is a lesser expensive model with a lower profile. Still made with stainless steel mesh and the prices starting at $100. Made in the USA. Hit your back button on your browser and it's the link below this one. For more information. Then we make a four piece fire pit screen that you see here. These are made with two front pieces that are independent doors that open out and the back away from the fire and two pieces that are fixed in place. These are made like all of our fire pit screens using the best materials. We offer this type of screen with two options. We have our Deluxe model using Stainless steel mesh and we use mild steel for the frame. The other option is making the whole screen out of 100% 304 Stainless Steel. The four piece screen pictured above comes in any size you may need. We have custom built these screens up to 12' in diameter so we can accommodate just about any needs you may have. How We Manufacture our FIre Pit Safety Screens. Let's start with the most import and part of the screen. The screen material. We use a mesh that consist of 8 lines of ss wire by 8 lines of ss wire that's woven into a mesh or what's called a wire cloth. This wire is .028 thick (not 23 gauge-ours is thicker). This mesh is very expensive but because we buy it like a commodity years in advance we get the best material at great prices. Then we make a frame. 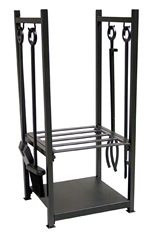 This frame comes in mild steel or 100% stainless steel. The most important part of the frame is the base ring that sits on your fire pit. We use 2" x 1/4" or some times 3/16" on smaller frames. No one else on the market uses 2" material on the base. Then we use 1" material on the uprights of the frame. Anything wider is not necessary and it obscures the look of the screen. Then we form the SS wire cloth to the frame and we sandwich the screen material between two pieces of steel. The outer frame and we use an inner frame and we weld these two together sandwiching the mesh material. No one else does this. They spot weld the screen material to the frame. It's easier and saves in labor cost. Our method is very laborious but we do it for a good reason. The life of the screen. After many hours of observing the screen being used we noticed that the SS mesh expands a lot. The mesh takes on a life of it's own and when the screen cools off the mesh retorts back to the original shape. The issue with this is if the mesh material is welded to the frame and the mesh expands it puts a lot of stress on the mesh material and will eventually tear taking years of life from the screen. We sandwich our mesh material between two frames giving the mesh room to expand and revert back to the original shape. No or limited stress on the mesh material. On our deluxe screen using mild steel we use Stainless steel hinge pins to ensure the hinges don't seize up when not used for extended periods of time. So Why Would You Want To Upgrade to 100% Stainless Steel? Will the 100% SS screen last longer then the deluxe model? Probably not. The issue is rust. The deluxe model using a mild steel frame will need some touching up with some high heat paint sooner or later. Period. Your putting this screen through some rather harsh conditions and it will need some maintenance. But this isn't the reason to upgrade to 100% SS. The main reason is when it rains the water will flow down the screen and sometimes when the water flows through a weld joint it could dye the rain water a red tint and this red dyed water could leave a water mark at the base of the screen onto your mason work of your fire pit. You could see a round red ring on top of your coping of the fire pit. This could and most likely will happen to any fire pit screen on the market that's not made using 100% stainless steel. Ok So Now You Know How We make The Fire Pit Screens Let's Talk About Sizes and Money. We make fire pit screens in a round, square or rectangle shape. To size the correct screen typically we add four inches to the inside diameter of the fire pit giving 2" over hang all the way around the pit. But I've changes that thought a little. On anything over a 48" screen and 6" to the inside diameter adding 3" clearance all the way around. I have found this is a safer choice because of the larger size needs more wiggle rook. We will make the screen any which way you choose but this option is just a rule of thumb sort of speaking. We suggest that when you order the screen ask for an extra can of special heat resistant paint. We sell an extra can of of our special paint at our cost if you order the paint when you order the screen. Please consider this. It's $10 extra. This is a steel product that your putting into a fire. It will, not if, need touching up at sometime. All Fire Pits need a Firewood Grate and some Tools. •Why? So you can see the fire at eye level. •Makes it easier to light the fire and to add firewood. Gets air under the fire. •The fire burns better and cleaner. •Makes cleaning the fire pit easier. •Keeps the firewood out of the ashes.